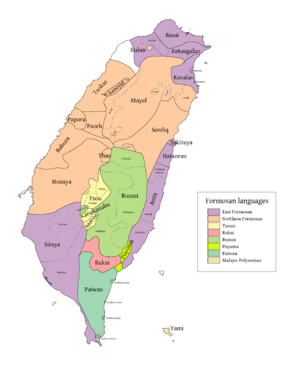 The East Formosan languages consist of various Formosan languages scattered across Taiwan, including Kavalan, Amis, and the extinct Siraya language. This grouping is supported by both Robert Blust and Paul Jen-kuei Li. 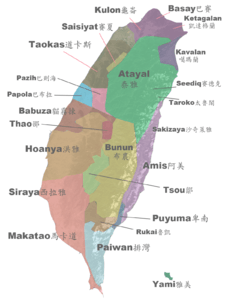 Li considers the Siraya-speaking area in the southwestern plains of Taiwan to be most likely homeland of the East Formosan speakers, where they then spread to the eastern coast of Taiwan and gradually migrated to the area of modern-day Taipei (Li 2004). Li (2004) presents the following criteria as evidence for an East Formosan subgrouping. Li (2004) notes that the split of *k into k and q (before *a) is shared exclusively by Basay and Kavalan. Like Kavalan and Basay, the Siraya language merges the patient-focus and locative-focus forms, although Amis distinguishes the two focus forms. Li (2004) also lists dozens of lexical innovations shared by the East Formosan languages. The Basay, Kavalan, and Amis also share an oral tradition stating a common origin from an island called “Sinasay” or “Sanasay,” which is probably the Green Island of today. ↑ Hammarström, Harald; Forkel, Robert; Haspelmath, Martin; Bank, Sebastian, eds. (2016). "East Formosan". Glottolog 2.7. Jena: Max Planck Institute for the Science of Human History. ↑ Li, Paul Jen-kuei. 2008. "Time perspective of Formosan Aborigines." In Sanchez-Mazas, Alicia ed. Past human migrations in East Asia: matching archaeology, linguistics and genetics. Taylor & Francis US. Li, Paul Jen-kuei (1992). "台灣平埔族的種類及其互關係" [Classification of the sinicized tribes in Taiwan and their internal relationships]. In Li, Paul Jen-kuei. Selected Papers on Formosan Languages, vol. 2. Taipei, Taiwan: Institute of Linguistics, Academia Sinica. Li, Paul Jen-kuei. 2004. Origins of the East Formosans: Basay, Kavalan, Amis, and Siraya. Languages and Linguistics 5.2:363-376, 2004.